It sounds too good to be true, but guess what? It’s absolutely real. Orange Leaf Frozen Yogurt, a frozen dessert franchise with 300 locations in the United States and Australia, recently announced that it has started offering self-serve smoothies in its stores. Yes, you heard it right… Self-Serve Smoothies! And here’s the greatest part: customers at participating Orange Leaf Frozen Yogurt locations are able to self-serve their smoothies from the same soft serve self-serve smoothie machine that normally dispense frozen yogurt. A refreshing blend of Dole® pineapple soft-serve, real strawberries, and bananas, this low- fat, low- calorie Smoothie is also vegan, dairy-free, and gluten-free. A summer thirst quencher featuring the tart flavors of pink lemonade blended with sweet real strawberries, this low-fat, low-calorie Smoothie is also dairy-free. A creamy blend of vanilla froyo, fresh milk, peanut butter, and real bananas, this gluten-free Smoothie is a protein-packed, pick-me-up treat. Self-serve smoothies are delicious and fun! 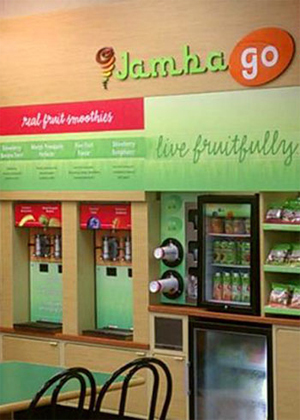 Smoothies that can be self-dispensed from soft serve frozen yogurt machines are great treats for on-the-go customers. Taking a road trip? Stop at any participating Orange Leaf Frozen Yogurt franchise around the United States (or Australia) and take a smoothie with you in your car! Fight the summer’s heat with a cool and refreshing smoothie. 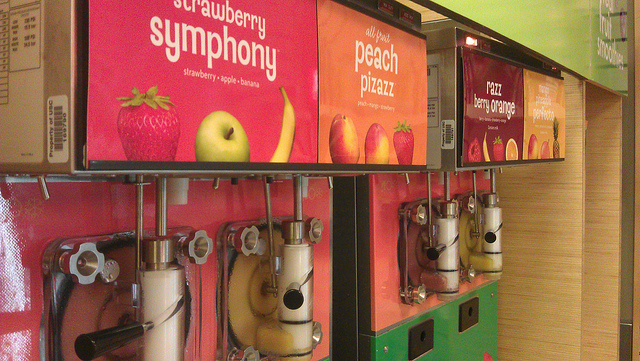 Try something different by selecting a smoothie instead of frozen yogurt from an Orange Leaf frozen yogurt machine. The self-serve smoothie option being offered at participating Orange Leaf Frozen Yogurt locations is innovative and exciting. It allows customers to select a treat besides frozen yogurt from the franchise’s soft serve frozen yogurt machines. We not suggesting that anyone would ever need or a want a break from traditional frozen yogurt… but self-serve smoothies are an excellent alternative! For more information about Orange Leaf Frozen Yogurt franchises, the flavors of yogurt and smoothies currently available, their soft serve frozen yogurt machines, and the nutritional facts about the food items sold, visit Orange Leaf’s website. Orange Leaf self-describes itself as a “frozen dessert franchise that offers a multitude of delicious traditional and original flavors, including no-sugar-added, gluten-free, dairy-free, and vegan alternatives.” When you try the frozen yogurt or smoothie that is self-served from an Orange Leaf franchise self-serve smoothie machine, you won’t be disappointed! including information on how to purchase and shipping to my country Botswana.